Avondale is the first SA cellar to utilise the ancient Georgian Qvervi in our winemaking process to create unique wines of exceptional flavour, complexity and colour. 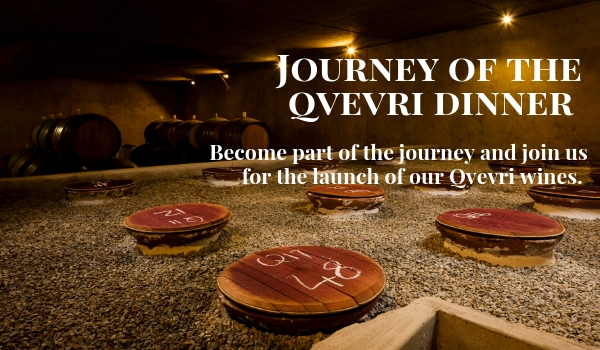 Become part of the journey and join us for the launch of our Qvevri Wines. Estate’s proprietor Johnathan Grieve and winemaker, Corne Marais will be partnering up with Chef Dale Stevens to create a truly remarkable food and wine journey. The focus of the evening is naturel with inspiration driven by raw, low-intervention, artisanal, craft with minimal interference or use of additives. Follow the team through multiple locations to experience a sensory 3-course dinner with a difference paired with new and exciting wines. * Included in the cost is the cellar experience, food & wine pairing and gratuity. As Members you will enjoy priority booking for any of Avondale’s nationwide events, at a discounted rate.